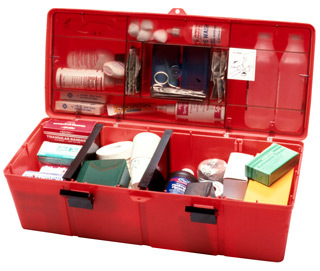 The Emergency Medical Box has proven itself, over the last 20 years, to be the perfect companion to thousands of mobile medical personnel. First Aid, Paramedic, Police and Rescue Squad Professionals. All appreciate the flexibility provided by this 100% usable container. When supplies are needed quick, there is no better box! It features a full 1650 cubic inches of usable storage with no wasted space. The lid alone, offers eight roomy compartments for packing and separating supplies. These items are held securely in place by a single transparent divider. The bottom of this box provides a large 20 x 9 x 4 inches space for oversized items. A movable divider is also included for optional partitioning of this section. The high impact polypropylene body is firmly held together by stainless steel hinge pins and polycarbonate latches. This box can endure very rigorous handling. It measures a full 21 x 9 x 9 inches and may be pad locked for security.